The Havanese is truly a delightful little dog. They have happy, outgoing and immensely entertaining personalities. Havanese are excellent with children and are loyal, devoted family pets. To Know Them is to Love Them! The Havanese is an old breed of the Bichon Family. They were first recognized in the Mediterranean area and may have originated on the island of Malta. Today's Havanese descended from those found in Cuba. They were introduced into the American Kennel Club's registry on June 30, 1995, entered the Miscellaneous Class on February 1, 1996 and began competing in the Toy Group on January 1, 1999. The Havanese size is measured in inches (measured from the top of the shoulders to the ground) and ranges between 8-1/2 and 11-1/2 inches. The weight of the adult Havanese varies depending upon his size but usually ranges between 7 and 14 pounds. What do they act like? 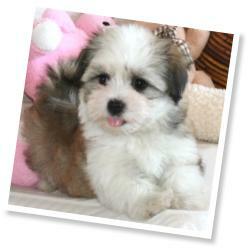 The Havanese is a very sweet and affectionate breed with exceptional intelligence and quick wit. They are sturdy, playful and very entertaining. As if having springs for legs, the Havanese possess a very clown like personality and are often quite busy. They are excellent with children , other pets, and get along well in almost every situation. The Havanese comes in a wide variety of colors and color patterns with no preference being given to one color over another. The colors can range from pure white to shades of cream, gold, black, blue, silver, chocolate or any combination of these colors including pied, parti or brindle combinations. No. The Havanese has a COMPLETELY NON-SHEDDING coat. Since the Havanese does not shed and has a low dander level, they have been referred to as being "hypo-allergenic". Many people with asthma and other allergies have been able to own a Havanese without any adverse reaction. The Havanese coat is not trimmed or clipped for standard presentation. When kept with full coat, they do require frequent brushing since the coat does not shed. Most families prefer to keep their pets coats clipped short for easier care. Are they healthy? How long do they live? The breed is generally very healthy and long lived, however, all long-lived breeds may eventually develop some problems. The Havanese should be examined for patellar luxation, congenital cardiac health, congenital deafness and heritable eye disease. They may live to be as old as 18 years of age when they receive proper care. The average life span of the Havanese is about 14 years. Exclusive Property of Cornerstone Kennels. All rights reserved.